Our volunteers play an important role in helping Russell County Hospital provide quality health care to the communities we serve. Many opportunities are available for our volunteers to make a difference in someone's life, and the rewards of volunteering are just as numerous. 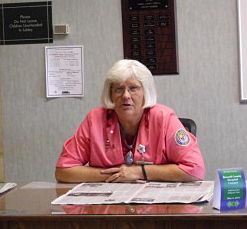 Our Auxiliary has served Russell County Hospital since 1981. We have over 50 members, and always welcome new members. Gift Shop - available in the front lobby, featuring a variety of gift items. Pillow Talk - Sew and stuff pillows for surgery patients. Reception Desk - Greet visitors, answer and direct telephone calls. Shredding Service - Collect and shred recyclable items from departments within the hospital. For more information about the Auxiliary and how you can become a member, please call Elizabeth Richards at (270) 866-4141 ext. 567.